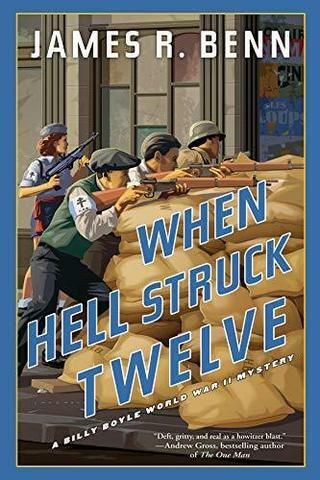 When Hell Struck Twelve - to be published 9/3/19. Join Billy Boyle in his fourteenth outing, this time in occupied Paris on the eve of Liberation. "exceptional...Details about ways to deceive the enemy about Allied army strength lend verisimilitude. Benn has never been better at integrating a whodunit plot line with a realistic depiction of life on or near the battlefield." "Once again, Benn has unearthed a fascinating piece of relatively unknown WWII history and built an engaging mystery around it, combining the Ghost Army with a chilling view of the ugly reparations exacted by Resistance fighters on assumed Nazi collaborators. Liberation, Billy is shocked to learn, has its own dark side." "Benn's plotting and his first-person narrative both acquire more gravitas as they continue to chart the course of World War II. His latest outing is a complex tale that hinges on a particular moment in world history he captures incisively." Publisher's Weekly on The Devouring: "...suspenseful...Benn does his usual excellent job of incorporating historical background into a fast-paced plot, which barely slows down on the way to the satisfactory resolution." "Benn molds an entertaining story out of Billy and his cohorts’ encounters with odious Swiss bankers and a cadre of Gestapo agents stationed in Bern to protect the loot. Great history here." "Extensive historical and military contextual detail, copious suspense, plenty of action, and the innate politics of power are distinctive traits of this acclaimed World War II–set series....The theme of Swiss complicity with the Nazis and their profiteering is absorbing and should appeal to historical fiction fans, mystery readers, and military buffs." "This is the twelfth installment of the Billy Boyle World War II Mysteries, and these creations just keep getting better and better." "Billy Boyle gets better and better. This is a must-read series." The Horse Chestnut Tree, James R. Benn's award-winning short story, is included in this collection published by Level Best Books. The story won the 2018 Al Blanchard Short Story Award.